Sheffield Olympic Legacy Park is set for further significant development on the back of its most successful year so far. International recognition, a national design award, high profile visits and events, educational achievements and continued development have all featured prominently in the last 12 months for the London 2012 Olympic legacy project for health and wellbeing research and learning. A number of key visits took place during 2018, including the Foreign and Commonwealth Office International Leaders Programme and two delegations from the Department of International Trade, who learnt first-hand how Sheffield Olympic Legacy Park is delivering the four legacy themes from London 2012 – sport, community, environment and economy. Other visits throughout the year included Her Majesty The Queen’s personal representative in South Yorkshire, HM Lord-Lieutenant of South Yorkshire – Andrew Coombe, the Master Cutler of the Company of Cutlers in Hallamshire – Ken Cooke, the Lord Mayor of Sheffield – Coun Anne Murphy, Presidents of Sheffield Chamber of Commerce – John Hayward and Steve Manley, and Sheffield City Region Mayor – Dan Jarvis. In June, just ahead of the 70th anniversary of the NHS, Sheffield Olympic Legacy Park hosted an event at the House of Commons to brief MPs and Civil Servants on how the Park is ‘putting physical activity at the heart of the NHS’. Sheffield Olympic Legacy Park also played host to a strongman bus pull event in June to celebrate Sheffield’s annual Move More Month, introduced two regional events to the park in September – Sheffield Urban Cyclo Cross and South Yorkshire Orienteers, and welcomed almost 700 guests to the English Institute of Sport Sheffield in October recognising past, present and future athletes at Sheffield’s Celebration of Sport. The 3G pitch is now home to two professional sports teams – Sheffield Eagles Rugby League Football Club and Sheffield United Women Football Club. Sheffield United Women is the first women’s football club in the country which doesn’t have to share a stadium with either their men’s teams or academy teams. 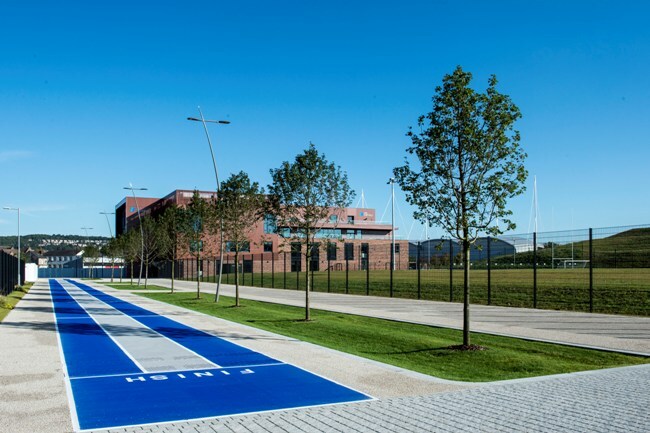 The landscape at Sheffield Olympic Legacy Park received national recognition, winning the prestigious Landscape Architecture of the Year category at the 2018 AJ Architecture Awards in December. Designed by Ares Landscape Architects and procured by Sheffield City Council, the landscaping was completed by a Sheffield based project team including Henry Boot Construction, Turner & Townsend and Arup. Educational success is reflected by the latest figures showing almost 900 students are currently studying at Oasis Academy Don Valley and UTC Sheffield Olympic Legacy Park, learning, developing new skills and accessing new opportunities. Most noticeably, the structural steelwork of Sheffield Hallam University’s Advanced Wellbeing Research Centre (AWRC) is now in place. Building work is being led by BAM Construction Ltd with a local design team including HLM Architects and Turner & Townsend. Looking ahead to 2019, the AWRC will be completed and the state-of-the-art facility will carry out world-leading research in physical activity to develop innovations that help people move. Scarborough Group International will begin work on the 3,900 capacity Community Stadium providing facilities for players and spectators of Sheffield United Women FC and Sheffield Eagles RLFC. The main stand will provide more than 12,000 sq ft of office and conferencing space, including business incubator units. A Centre for Child Health Technology will be progressed to bring further research, innovation and private sector investment to Sheffield Olympic Legacy Park, building on the growing reputation as a leading location to collaborate on improving health and wellbeing and creating a life sciences opportunity zone. A number of memorandums of understanding have already been signed with leading healthcare organisations including Canon Medical, IBM and Philips. Work is being carried out with Scarborough Group International, Sheffield City Trust and Sheffield City Council looking at investment opportunities in the wider area to provide high quality offices, laboratories and other business accommodation for organisations in the life sciences and medical technology sectors. Former Minister for Sport and Project Lead for Sheffield Olympic Legacy Park, Richard Caborn, said: “Sheffield Olympic Legacy Park continues to go from strength to strength. 2018 has been another success story and the range and depth of regional, national and international visits, activities and events demonstrates how we’re delivering the four key themes from London 2012. “Sport – improving infrastructure and providing access for all levels of ability; Community – providing opportunities in education, skills, training and jobs; Environment – enhancing the amount and quality of green space and promoting sustainable travel; and Economy – creating jobs and wider employment opportunities.